Stephen’s Saga Issue # 7 Book Two Entente is Launched! Well, The Irish Clans Book Two, Entente is finally launched! 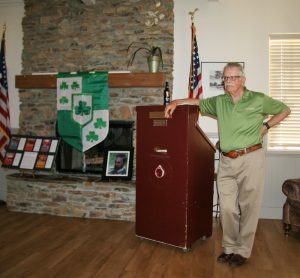 On Friday, June 16 I spoke to a group of thirty-five of my Irish Adventurers at Greenhorn Creek Golf Club in Angels Camp, CA. Most of these readers had been anxiously awaiting this next novel in the series and were happy to receive a signed copy of Entente . I spoke of my reasons for writing historic fiction regarding the individual and national struggle to achieve freedom and justice from an oppressive agent, in this case the Irish Republic’s revolution against Great Britain in the early 1900s. This literary mission is primarily fueled by my concern that our society, like all those before it, is showing clear signs of deviating from the principles established by our forefathers in our Declaration of Independence. I will elaborate in future letters. Since Entente immerses my readers in the horrors of the Western Front in Belgium during WWI, I spoke about the politics and military advances that led up to and caused the mired down tragedy of this war-to-end-all-wars. In addition to emphasizing the terrible sacrifice of over seventeen million people which didn’t end all wars, I pointed out the fact that humanity does not appear to learn from these cataclysmic atrocities. 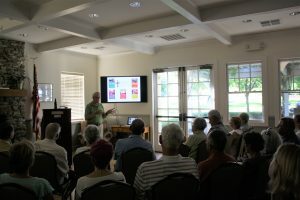 The audience appeared to enjoy my presentation, even though I chose not to read any “juicy bits” from the novel itself. Instead I recited the poem of dedication that I had written to honor the men and women who showed great courage during this terrible four year war. One reader asked if I, a former aerospace nerd, had really written the romance scenes. I admitted that I had with some tweaking by my fine editorial team. I took the snickering in the room as a positive sign. All in all, this launching was a grand success. 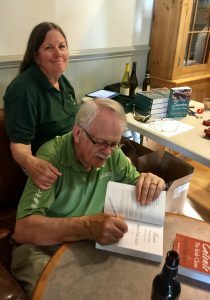 The wine was flowing and the Irish appetizers were enjoyed while I signed copies. I am very appreciative of my readers who are supporting my literary journey. I will be conducting future talks and signings in San Francisco, Sacramento and Jackson CA, as well as Reno NV, among other places in the coming months as my schedule allows. I will keep you apprised of these events ahead of time. Early partial reviews of Entente in the week since this launch have been very positive. One of my Irish adventurer readers has already finished the novel and is wanting Book Three Rising as soon as possible. I am happy to announce that this novel is written in draft and is now in editing for release by year end. That’s when the adventure story really gets exciting! Our journey continues together . . .
News Flash! 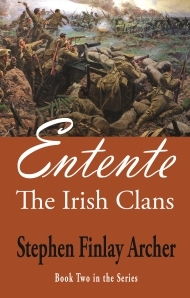 The E-Book for Entente is now available on Amazon/Kindle or buy the print book through my store!